I used 3 large beets I bought at the Amish market. 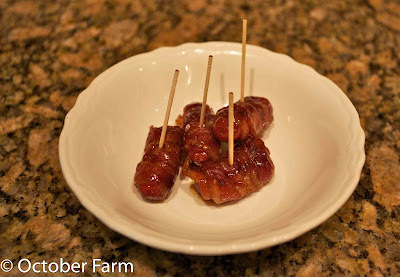 Cut them into 1" cubes. Yes, your hands will look like you just killed someone. 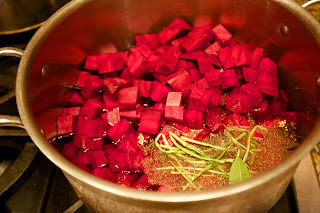 I save and freeze stems from herbs so I used some frozen dill stems and removed them after the beets cooked. My old way of making these called for boiling the beets first. With this recipe, you throw the raw cubed beets in the pot with the other ingredients, bring it to boil and then simmer until the beets are fork tender, about 15 minutes. 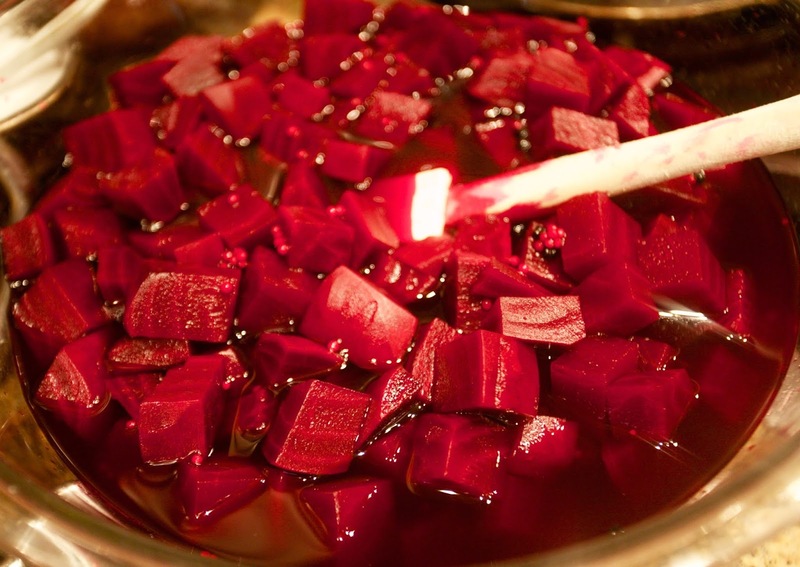 The beets absorb a lot of the liquid as they cook which gives them great depth of flavor. I made about 15 hard boiled eggs, peeled them and then layered them with slices of raw sweet onions and the beets in these jars. Within 24 hours the eggs have turned red and are ready to serve. Easter cooking has officially begun! Mmmm, this sounds good! Pickled beets rock! 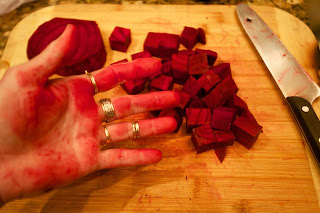 When I peel and slice raw beets, I always wear disposable vinyl gloves to prevent my hands turning red. 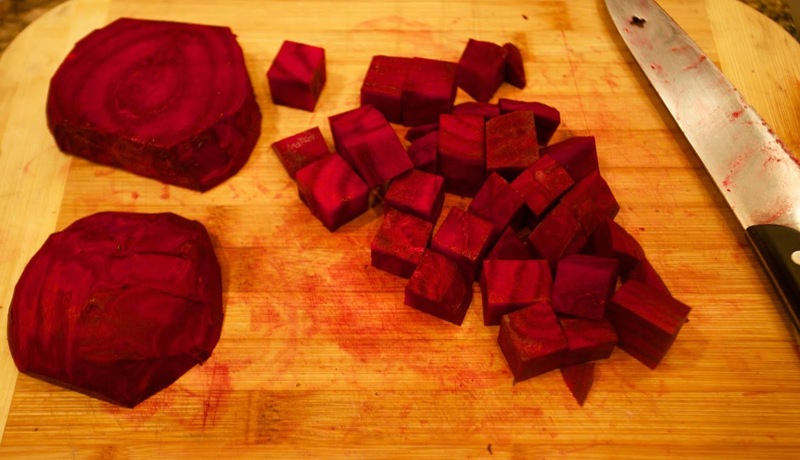 Many people parboil their beets first so the skins slip off easily, but I don't do that because the extra cooking turns the beets to mush later when cooked again in the recipe. I prefer my beets to remain firm -- better "mouth feel" that way. I have some in the refrigerator that my daughter gave me I January. My mom used to make them all the time. She was Lancaster County, PA born so those recipes were in her blood. looks intriguing despite having avoiding them my whole life. I have a box of surgical gloves I keep in my kitchen that I keep for jobs like peeling and cutting bleeding veggies like beets or hot jalapenos. It's a good thing. 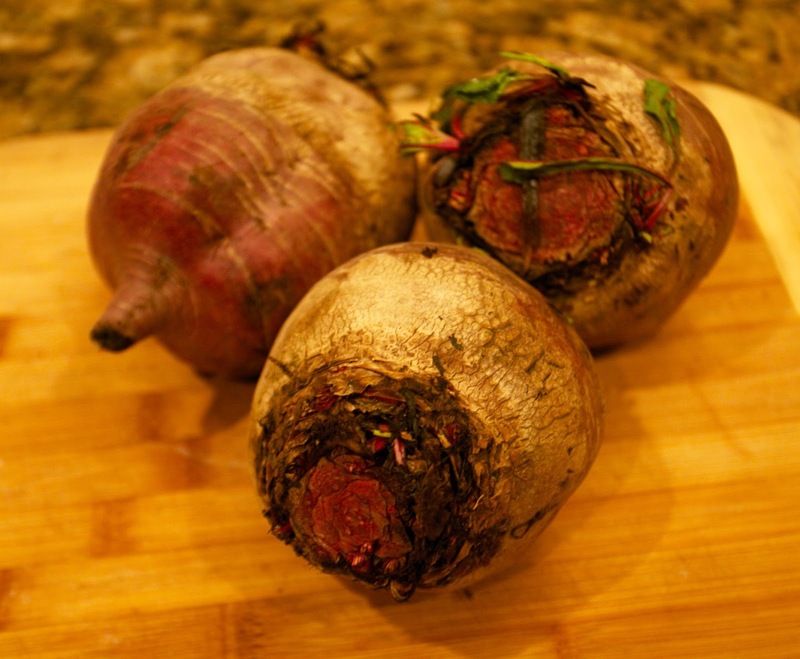 I usually cut up my beets in slivers and cook with dill and vinegar then let sit in the refrigerator to cool before I garnish my dinner salad with them. Tasty. 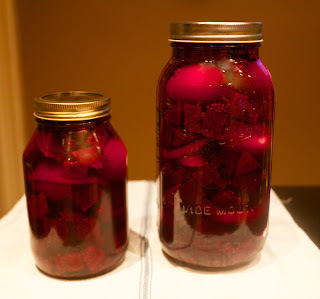 I LOVE pickled beetroots. We have them with "pâté chinois" (shepherd's pie) in Québec. Qhen I was a kid, I mostly ate the beetroots. 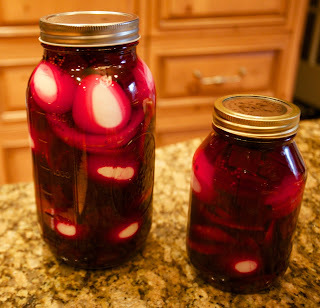 I also love a good pickled egg. I LOVE beets, 2nd Man not so much...maybe this will change his mind like you did. 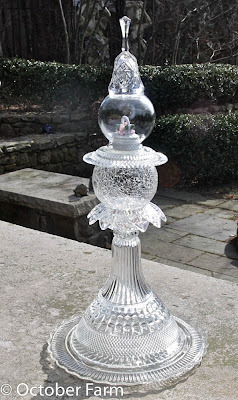 Plus it's stunningly beautiful. 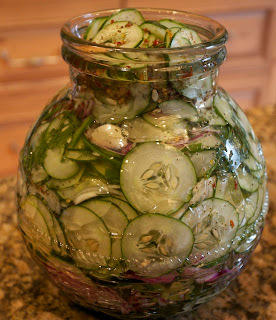 OK, I'm going to make these this weekend. I'll see if I can make them come out as blogworthy as yours (and of course give you credit). Thanks for sharing!! Oops, one question, are eggs a normal part of it or did you just add them because you had them? you can definitely make them without eggs. i always add the eggs because when i didn't eat the beets, the eggs were the best part!